the EMC2 and Viaméca French clusters for competitiveness. The French project ARROW, which started in October 2011, is funded by the French Research Agency (ANR) and is part of the French EquipEx named RobotEx. It deals with the technological problems that limit robot productivity when used for industrial applications requiring a very good accuracy and high acceleration capabilities. Up to now, robot designers have focused either rapidity or accuracy. This is due to the fact that, on the one hand, high accelerations lead to physical phenomena that decrease the accuracy and, on the other hand, accurate machines are generally heavy and, as a result, quite slow. However, very fast and very accurate robots would lead to productivity improvement for some applications such as light machining and microelectronics assembly. This is the main motivation of the ARROW project. Robot design: this axis focuses on the synthesis of new robot architectures, their evaluation at the preliminary design stage, the optimisation of their dimensions based on their kinematic, kinetostatic elastostatic, dynamic and elastodynamic performance and the detailed design. Advanced control: this axis focuses on the determination of control laws to take advantage of the best performances of the designed robots in order to reach the required acceleration and accuracy. Assembly of micro-components: such a task requires fast pick-and-place motions with high accuracy at the end of the trajectory. Milling of soft material: such a task requires fast accelerations locally in order to machine a fillet with small radius for instance, medium velocity with high accuracy all along the trajectory. In order to achieve the technological objectives of the project, each step of the robot design process has been optimized, namely, from the preliminary design stage dealing with the type-synthesis and evaluation of robot architectures, to the detailed design stage dealing with the shape and dimension synthesis of the selected robots and prototyping. Moreover, advanced control methodologies based on accurate robot models computed in real time will be used to obtain the optimal robot performances. For pick-and-place operations, a new robot named IRSBot-2 (Fig. 1a) with two translational degree-of-freedom (dof) plus one rotational dof (obtained through the use of a motor embedded on the moving platform) has been proposed . This mechanism performs two translational motions in a plane thanks to a parallel mechanism with spatial and hybrid architecture. Besides the IRSBot-2 turns out to be very stiff along all directions throughout its Cartesian workspace. Such a high stiffness is required to reduce vibrations. 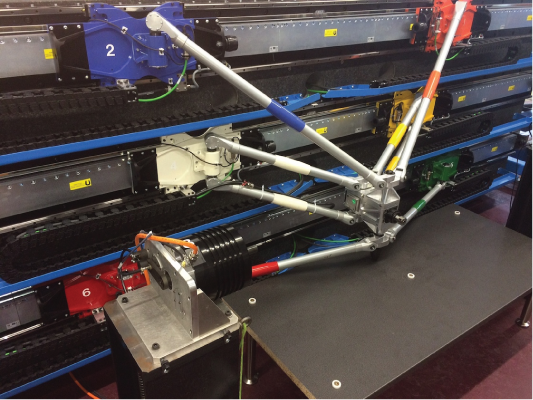 For milling operations, a new actuation redundant robot named ARROW-LIRMM (Fig. 1b) with five dof but having six linear actuators + 2 rotative actuators has been proposed . 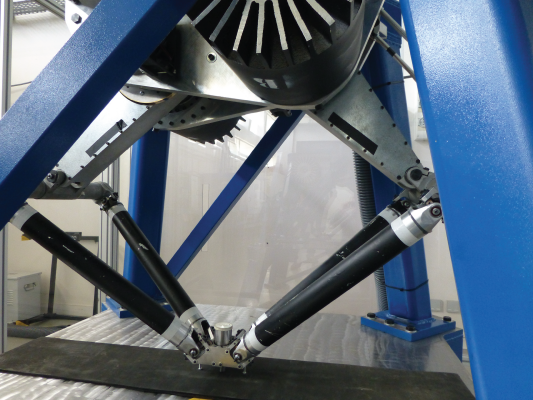 Thanks to redundancy, the stiffness of the robot is enhanced and its acceleration properties are homogeneous throughout its operational workspace. Proposition of optimal design approaches for high-speed robots: new design criteria  have been proposed and general multiobjective design approaches have been developed for the design of high-speed robots with high accuracy , . Proposition of new controllers: for high-speed operations, the challenge is to define robust controllers able to control the robot at high sample frequency. New adaptive controllers able to estimate the payload changes have been proposed . In parallel, methodologies for model identification able to increase the accuracy of the robot behaviour prediction have been defined . To increase the robot accuracy by avoiding the remaining modelling errors, control through exteroceptive sensors has been investigated . Finally, models for vibration prediction able to be computed in real time have been obtained . The ARROW project is an ongoing project (it will end in April 2016) and all obtained theoretical results will be validated on the manufactured prototypes (Fig. 1). Moreover, the development of elasto-geometric calibration methods in order to get the best accuracy performances for both robots is part of the future work. Obtaining 20G of acceleration with an absolute accuracy of 20µm on those prototypes is the key-point for the success of the ARROW project. FIG. 1 – Prototypes designed in the frame of the ARROW project. L. Nurahmi, S. Caro, S. Briot “Type Synthesis of Two DOF Translational Parallel Manipulators with Hybrid Legs,” Computational Kinematics, 2013, Barcelona, Spain. S. Briot, S. Caro, C. Germain « Robot à Deux Degrés de Liberté Présentant Deux Chaînes Cinématiques dont la Raideur en Flexion est Maximisée », FR2967603, May, 2012. S. Shayya, S. Krut, O. Company, C. Baradat, F. Pierrot “A Novel (3T-1R) Redundant Parallel Mechanism with Large Operational Workspace and Rotational Capability,” IEEE/RSJ Int. Conf. Intel. Rob. & Syst. (IROS 2013), 2013, Tokyo, Japan. D. Corradi, S. Caro, D. Chablat, P. Cardou. “Assembly Conditions of Parallel Manipulators Considering Geometric Errors, Joint Clearances, Link Flexibility and Joint Elasticity” 2014 IEEE Int. Conf. Rob. and Autom. (ICRA 2014), 2014, Hong Kong. C. Germain, S. Caro, S. Briot, P. Wenger “Optimal Design of the IRSBot-2 Based on an Optimized Test Trajectory,” ASME 2013 Int. Design Eng. Technical Conf. & Computer and Information in Eng. Conf. IDETC/CIE 2013, 2013, Portland, USA. A. Chemori, G. Sartori-Natal, F. Pierrot “Control of Parallel Robots: Towards Very High Accelerations” 10th International Multi-Conference on Systems, Signals and Devices (SSD 2013), 2013, Hammamet, Tunisia. S. Briot, M. Gautier “Global Identification of Joint Drive Gains and Dynamic Parameters of Parallel Robots,” Multibody System Dynamics, 2015, Vol. 33, No. 1. V. Rosenzveig, S. Briot, P. Martinet, E. Özgür, N. Bouton. “A Method for Simplifying the Analysis of Leg-Based Visual Servoing of Parallel Robots” 2014 IEEE International Conf. on Robotics and Autom. (ICRA 2014), 2014, Hong Kong, China. S. Briot, W. Khalil. “Recursive and Symbolic Calculation of the Elastodynamic Model of Flexible Parallel Robots,” The International Journal of Robotics Research, Vol. 33, No. 3, pp. 469-483.